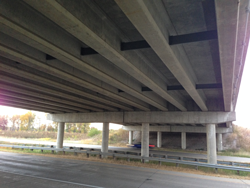 The primary objective of this project was to determine the effect of bridge width on deck cracking in bridges. Other parameters, such as bridge skew, girder spacing and type, abutment type, pier type, and number of bridge spans, were also studied. To achieve the above objectives, one bridge was selected for live-load and long-term testing. The data obtained from both field tests were used to calibrate a three-dimensional (3D) finite element model (FEM). Three different types of loading—live loading, thermal loading, and shrinkage loading—were applied. 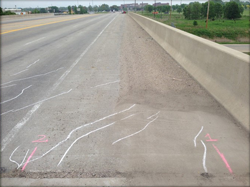 The predicted crack pattern from the FEM was compared to the crack pattern from bridge inspection results. A parametric study was conducted using the calibrated FEM. Longitudinal and diagonal cracking in the deck near the abutment on an integral abutment bridge is due to the temperature differences between the abutment and the deck. Although not likely to induce cracking, shrinkage of the deck concrete may further exacerbate cracks developed from thermal effects. Based upon a limited review of bridges in the Iowa DOT inventory, it appears that, regardless of bridge width, longitudinal and diagonal cracks are prevalent in integral abutment bridges but not in bridges with stub abutments. The parametric study results show that bridge width and skew have minimal effect on the strain in the deck bridge resulting from restrained thermal expansion. Pier type, girder type, girder spacing, and number of spans also appear to have no influence on the level of restrained thermal expansion strain in the deck near the abutment. Based upon the FEM results, an effective solution to reduce cracking in the deck might be to place an isolation pad between the soil and back side of the abutment. To put it into practice, more research work, including the material and placement of the isolation pad, should be conducted.